You have no doubt heard that it is important to provide ourselves with mineral nutrients but few of us understand the reasons why. Although vitamins and minerals are very different, it is essential that our bodies receive both. All vitamins contain carbon so are considered to be organic substances. Minerals on the other hand do not contain carbon and are therefore classified as inorganic. There are two categories of minerals which are major minerals and trace minerals. Inside the body, vitamins and minerals play many important roles. But whereas the body can continue to function without getting the recommended daily allotments of some vitamins, a mineral deficiency can lead to death. As important as they are, most people today do not really know that much about minerals and how they impact the body. In order to make the hemoglobin found in red blood cells, the body needs iron. In order to build strong teeth and bones, the body needs calcium. Calcium is also crucial for the proper functioning of the kidneys, muscles and nerves. Without adequate levels of Iodine, the thyroid gland cannot perform its most important task which is to produce energy. Manganese, selenium and zinc are antioxidants and some of their responsibilities include helping to heal wounds, helping the skeletal system develop properly, and protecting cell membranes. Chromium helps keep arteries clear. The minerals the body needs are divided into two categories. These two categories are: Major minerals and Trace Minerals. The difference between the categories mainly has to do with the amounts the body requires. The body must have a minimum of 100 milligrams per day to carry out the bodily functions associated with the Major minerals. In the case of Trace minerals, on a per day basis, less than 100 milligrams are required. All Minerals come from the ground but as few of us eat dirt and rocks, how does our body get the minerals it needs from the food that we eat? Minerals primarily make their way into our bodies by way of the foods that grow from the ground and the animals that survive off the land. Fruits, vegetables, lean meats, poultry, dairy products, grains, legumes. These and others are the primary sources of the minerals our bodies need to survive. What's also interesting is that individuals who eat a lot of processed foods or who fail to consume a nutritionally-balanced diet often suffer from diseases that have been directly attributed to vitamin and mineral related deficiencies. Much controversy surrounds the subject of mineral supplementation. Ideally, people should strive to meet their daily mineral requirements from food because, as is the case with some vitamins, excessive amounts of some minerals inside the body can have a toxic effect. Minerals are used for creating automobiles, building, pots, pans and many other durable products. 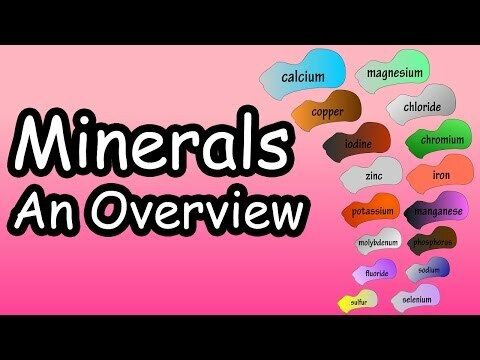 But most importantly for humans, minerals are essential for body and health in order to build and maintain strong bodies capable of functioning as designed!